Choosing the right door for your home can be difficult, with many options and varying prices available. 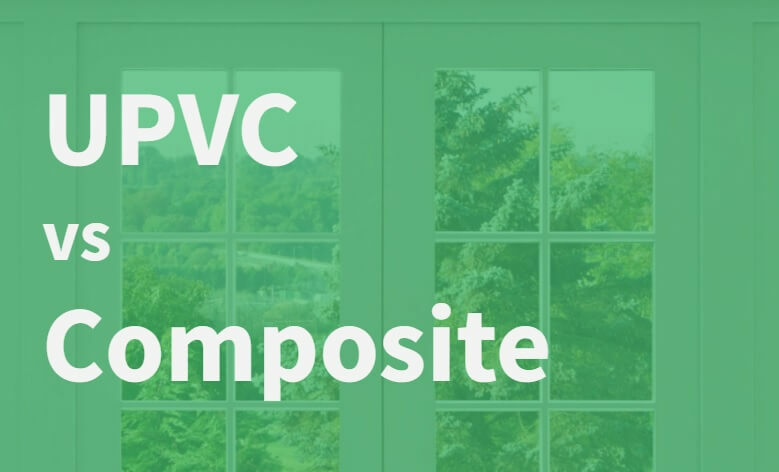 Two of most popular options are UPVC and composite doors; UPVC doors tend to be the cheapest option, but are also less secure than composite doors. UPVC is highly weather resistant and requires little to no maintenance for many years, but does not provide as much security or insulation for your home. Composite doors, therefore, are often seen as an ideal compromise between low maintenance and higher security. Slightly more expensive than UPVC doors, composite provides the look of a wooden door with the resistance of a UPVC door. We’ve listed the benefits of both UPVC and Composite doors in more detail in this article. Unplasticised polyvinyl chloride (UPVC), is used in doors, windows, guttering and pipes. When used in doors the material is wrapped around a core of galvanised steel, making the door much stronger than a traditional wooden door. UPVC windows and doors are far more fire resistant than traditional wooden doors, which can easily aid a fire should one break out in the home. UPVC provides a better barrier against the flames, and is less likely to catch fire itself. The increased thermal efficiency in UPVC materials means these doors are extremely effective at targeting condensation, which can lead to damp or mould if unchecked. UPVC requires almost zero maintenance, with highly weather resistant properties meaning it does not need to be varnished or sealed in its lifetime. In contrast, wooden doors require varnishing or painting several times to maintain their resistance to the outside elements, and to get the finish looking good. The materials used to manufacture a UPVC door means they tend to be the cheapest option, making them widely popular when factoring in their low maintenance benefits too. Buyers should be mindful, however, that the cheapest option isn’t always the best, as UPVC doors do mean some sacrifices on security and aesthetics. Finally, UPVC doors have the added bonus of being available in a wide range of sizes and styles. This gives you a huge selection of windows to choose from for your UPVC door, allowing you to select the one that will suit your home perfectly. A composite door gives the appearance of a traditional wooden door, but is designed with modern materials in order to improve security and weathering. It is often considered a popular mid-way point between UPVC doors and traditional hardwood doors. Composite doors are manufactured using a compressed wooden slab which is enclosed within a durable plastic edge banding, and two plastic door skins. This design enables the door to be extremely strong and sturdy, whilst still significantly less expensive than timber or hardwood. Composite doors are not prone to rotting or warping, and do not require varnish or paint like timber doors. They are therefore are far lower maintenance option, providing good insulation and effective weather resistancy year round. The durable materials used to construct a composite door guarantees a long life span, keeping your home secure and well insulated for years. The slightly higher cost of a composite door than a UPVC door is countered by the fact that a composite door is an investment that will last for many years. A big benefit of composite doors is the natural, realistic look they can have. Composite doors succeed in combining the durability and weather resistance features of UPVC doors, with the natural aesthetic appeal of hardwood doors, making this option the best of both worlds. Here at Abbey Glass, we have a wide selection of doors available, so we’re confident we’ll have the right door for you, whatever style you choose. We have an extensive range of colours, finishes and double glazing window options, with all our doors made to measure to ensure the perfect fit for your home. For more information on the doors we offer, feel free to contact our team today – we’re always happy to help with any enquiries you may have.